Onboard Tere Moana: If It's Tuesday, It Must Be ... St. Bart? If it’s Tuesday, it must be … St. Bart? Yes, it is Tuesday, and Tere Moana, Paul Gauguin Cruises’ new gem of a ship, is at the French island instead of the originally scheduled Virgin Gorda. It’s been a windy, wavy couple of days in the Caribbean, and our itinerary has changed several times as Capt. Rajko Zupan tries to find smooth seas — especially important for a ship as small as the 3,500-ton Tere Moana. So far, we skipped Tortola and Jost Van Dyke in favor of a second day at St. Maarten and then St. Kitts on Monday. Tuesday, the plan was to head to Antigua. But the captain turned around after encountering rougher-than-expected seas this morning and elected to come to St. Bart early. I confess to spending most of the morning in bed as we rocked our way here, but now we are in the bay, tendering is underway and the sun is shining brightly. It’s my first cruise on Tere Moana, the lovely little ship formerly known as Le Levant when it operated for Compagnie du Ponant. Paul Gauguin Cruises began operating Tere Moana about a year ago in the Caribbean, Latin America and the Mediterranean. 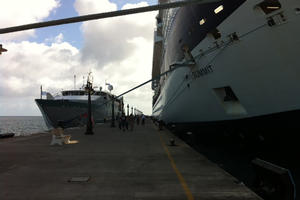 PHOTO: The 90-passenger Tere Moana, left, is dwarfed by the Celebrity Summit as both docked at St. Kitts on Monday. Paul Gauguin also operates the 332-passenger ship of the same name, primarily in French Polynesia, although it is sailing farther afield to Asia and Australia in 2014. Those who love small ships will love Tere Moana. 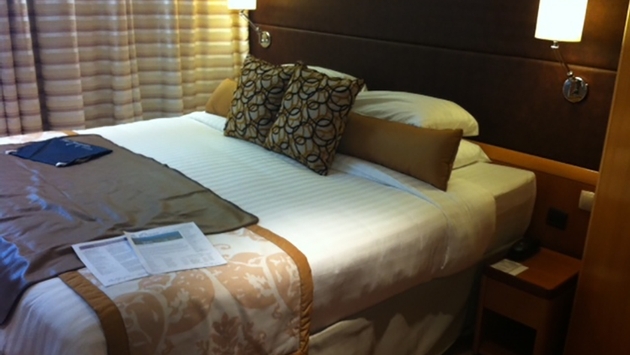 It accommodates just 90 passengers in 45 ocean-view staterooms. The ship underwent a renovation before entering service for Paul Gauguin Cruises, and the spacious staterooms have a fresh, sophisticated look. The main lounge is inviting and comfortable, with light wood panels and furnishings and some Polynesian paintings to reinforce kinship with the Tahiti-based ship. The ship also recently began operating two restaurants every night for dinner, the traditional L’Etoile and La Veranda Steak House in the indoor-outdoor eatery is also used for the breakfast and lunch buffets. 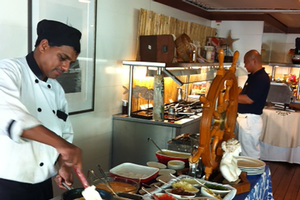 PHOTO: The breakfast buffet and omelet station on Tere Moana. Overall, the ship has a quiet, casually elegant atmosphere for adults who don’t need or want all the bells and whistles of the mega-ships. Instead of twisting water slides, the top deck on Tere Moana houses a hot tub and Balinese beds for relaxing. 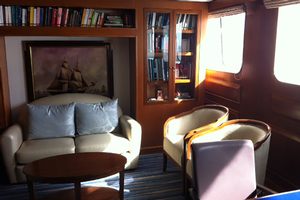 PHOTO: The small cozy library on Tere Moana. Monday’s entertainment was the crew talent show — it was great fun — and there’s otherwise a pianist in the main lounge. There is no casino onboard but there is a marina that can be lowered when the seas are calm. For those who want to explore the nooks and crannies of the world in an upscale, intimate environment, the Tere Moana is a perfect fit. As for our cruise this week, we’ll find out later today where we’re heading next. And wherever it is, I promise to send a postcard.